Neal Asher pumps out books like some kind of termite queen - 14 at the last count, plus four short story collections. It’s a work rate that most other writers struggle to match, but he’s been consistently putting out thick books that are both well-composed and showcase an increasingly sophisticated and coherent universe: that of the Polity. A space empire comprised mainly of humans and mainly managed by AIs, the Polity continues to expand into a galaxy that is genuinely big, scary and at best ambivalent to humanity. The Technician continues his galactic epic as both oppressed and oppressors struggle to come to terms with the end of a vicious religious dictatorship on the planet of Masada. An obscure and backward world, Masada holds the key to the mysterious racial suicide of an advanced race, the Atheter, who destroyed themselves utterly some three million years ago, following millennia of war caused by the discovery of the even more ancient and advanced technology of the Jain – technology the Polity itself is now wrestling to understand. Jeremiah Tombs, a former member of the hated ruling caste on Masada, is now quite insane after surviving an attack by the eponymous Technician. The Technician painstakingly removed his face and most other non-essential body tissue, but may also have done something else to Tombs – no one is sure what. The hated Polity saved his life after this horrific attack and has realised that the Technician is not simply some freakish predator. With Tombs now insane, however, the race is on to discover what he knows – but doesn’t realise he knows – before a massive structure of unknown origin but hostile intent reaches Masada to finish a job it began three million years earlier. 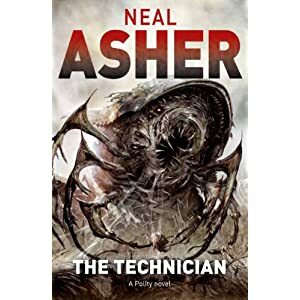 I’ve dipped in and out of Neal Asher’s Polity universe over the years; I haven’t read all of his books but do keep coming back for more because they’re straightforwardly entertaining. Sometimes you want a bit more depth from a book, but there are times when all you want are brisk stories with yucky aliens, cool technology, massive spaceships and killer robots. Cue Neal Asher. The Technician isn’t Proust; it’s brash and it’s gaudy, and Asher’s interest in characters tends less toward their motivation than their evisceration. People (and aliens) die all the time in these books, and never peacefully in their beds surrounded by loved ones. Asher might just be on a personal crusade to find ever-more disgusting and horrific ways that technology can kill us. This is not your New Wave SF, this is space opera with all the original ingredients cranked up to 21st century levels. What is fascinating is Asher’s ongoing development of his universe, the big picture that is slowly being drawn into focus through all of the little pictures he has drawn in his novels. Where is it all leading? I don’t know, and I wonder if Neal Asher knows either. But one thing’s for sure: it’s going to be big, loud and liable to explode.